Virgin Voyages has given us a sneak peek at the suites that will be on their first cruise ship, Scarlet Lady. The adults only cruise line will debut in 2020 with sailings opening for bookings next month. Massive Suite – Three rooms and a terrace fit for rock & roll royalty define this suite, with an outdoor hot tub, music room, runway table, Peek-a-View shower. 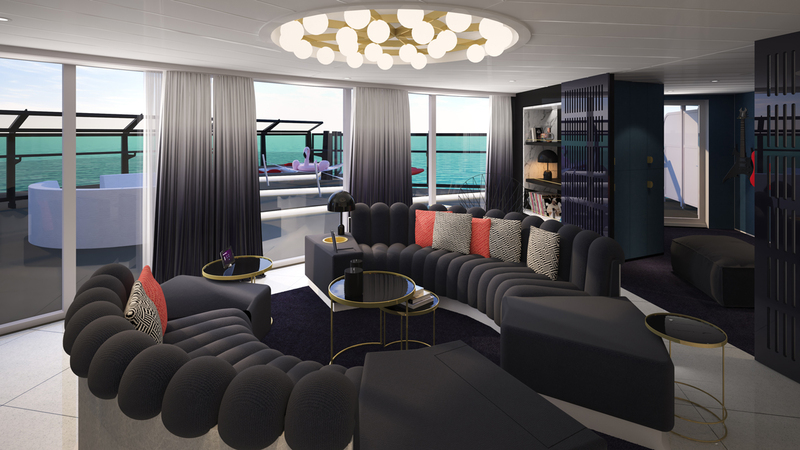 Virgin Voyages is throwing out traditional clichés on luxury and formalities, and instead bringing Rebellious Luxe to life at sea with their RockStar Suites designed by Tom Dixon’s Design Research Studio as the pinnacle of that experience.